The Rebel Sweetheart. : Wordless Wednesday #138 | Way Back When. Found my husband's old wallet while rummaging through the drawers. Aw how sweet naman. 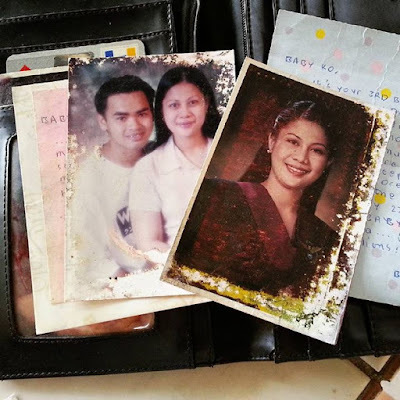 Talagang iningatan po ng hubby niyo yan. So memorable po sa kanya yan i'm sure :-). awww! What fun things to find, though! That's not cheesy. That's beautiful. Great flash backs are always fun!! Sweet memories. Puts a smile on your face, doesn't it? Not cheesy at all! I think it's sweet! That is too cute! I love finding old love letters. Love it! It's always fun to come across old photos! I think it's so sweet of him to have that stuff saved. He's a romantic! That is so sweet. I don't like some of my old photos and need to burn a select few. You two look so young, enjoy the fun memories. Cheesy and definitely sweet. Things like these always bring a smile. Those were the good ol' days. I find it super sweet of your husband to have kept all these. Aww, how sweet! I love finding my husband's old love letters and handmade gifts.